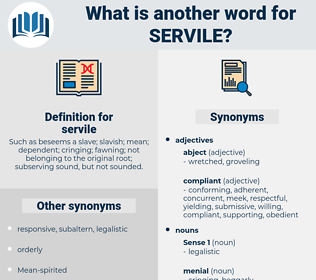 What is another word for servile? 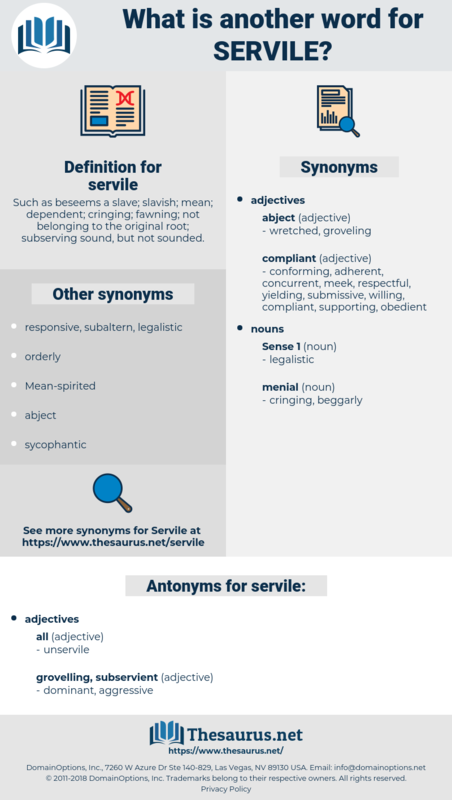 Such as beseems a slave; slavish; mean; dependent; cringing; fawning; not belonging to the original root; subserving sound, but not sounded. lordly, arrogant, high-handed, superior, supercilious, uppity, haughty, imperious, free. Adelaide did not know whether it were servile or superb to care little about knowing his opinion and intentions in regard to her. From his feet, the member of inferiority, proceeded the Sudras, or servile caste. scurvily, shrivel, survival, screwball, sorb apple, sorrowfully, sourball, serval, scruple, scrappily, Scrapple, sugar bowl, serve well, scrofula, sharply, surveil, scribble, servilely, soccer ball, scrub fowl, sugar apple, sorrowful, scrabbly, scrabble.